Caressa has just been released from a lengthy stay in a psychiatric hospital. In attempt to put this past behind her, she joins three friends on a weekend trip to a remote lake house. Once there, she begins hearing strange noises and quickly questions her surroundings and her sanity. Director Corey Norman's previous short film, The Barn (read the Fright Meter review here) succeeded tremendously in being a subtle, atmospheric, and creepy short film that possessed an equal amount of style and substance. With NATAL, Norman sheds the subtleness and replaces it with a more visceral tone, and in doing so proves he is more than capable and confident in working with the different shades of the genre. NATAL attempts to appeal to a different type of horror fan than The Barn; fans who grew up devouring films such as The Evil Dead and Friday the 13th. This is not to say that NATAL copies these films or, if being honest, is as gruesome as them, but one can certainly recognize and appreciate the understated winks to these films. The thirty minute running time is handled extremely well; the film never seems too long or too short. And while there are definitely slasher film elements at play, what is appreciated is that these elements are balanced with the proper amount of characterization. Often times, short films, by their nature, are not able to develop characters or plot points adequately. NATAL actually does both quite well. The four actors in the film have great chemistry together and it is immediately believable that they are friends and have been for quite some time. Of course, there are major conflicts brewing just ever so slightly beneath the facade of their perfect relationships that are fairly easy to predict, but do not come off as forced or unbelievable when revealed. The characterization never overpowers the plot, though, as an equal amount of tension and creepiness occur throughout the film. The strange and incessant scratching noises that Caressa hears at the same time every night are unsettling, as is witnessing the deterioration of her sanity and her relationships in such a remote and confined location. As the story marches towards its climax, it is not terribly difficult to figure out what is going to happen. However, what NATAL does is make it less easy to figure out just to who the inevitable horrible stuff will happen. The frenzied climax is disturbing, though some may be left scratching their heads in trying to figure out just what exactly occurred and why. For these viewers, it would be wise to suggest that they remember and consider the title of the short film and consider it along all that they witnessed on screen. Overall, NATAL is another effective and thought-provoking short film from Corey Norman and his Bonfire Films. He is proving that he knows horror, he appreciates horror, and he has a passion for the storytelling aspect of filmmaking. Between this short, The Barn, and his entry for The ABC's of Death 2 twenty-sixth director competition, M is for Mother, the potential for him to break into the horror industry with a bang is apparent. 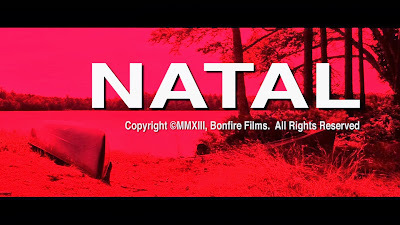 After checking out NATAL, definitely be on the look out for his first full length feature film, The Hanover House.